Pam-a-rama ding dong: Mario Party! For those who know my kids, you know that to say they are into Mario is an understatement. They LOVE Mario, are obsessed with Mario, own dozens of tiny 2” Mario character figures, as well as the larger plushies. And, of course, the Wii games. And the costumes, some of which I had to make because for some reason you can’t buy a kid’s Yoshi costume for less than $150, or at least you couldn’t last year when he wanted to be Yoshi for Halloween. I am also in the middle of a Bowser costume and a Rosalina costume for this year’s Halloween. Crazy. This year will be the third all-Mario Halloween. It is not at all uncommon for me to be seen at the grocery store or a friend’s house with at least one child dressed as someone from the Mario pantheon, so at least the costumes get a lot of use. My son asked to wear one of his to the first day of kindergarten, and was disappointed when I said no. He has had to satisfy himself with wearing a Mario-emblazoned shirt every single day to school, except the first day. Year 1, ambitious favors with handmade hats! The favors from year 1 included handmade Mario hats. I think the hats were $2 at Hobby Lobby and I used iron-on T-shirt transfers (for dark T-shirts so the white would be opaque). I printed the Mario M-circle onto the transfers, cut them out, and ironed them on. This was a lot of work, so I wouldn't recommend it for a big party, but if you're just having a few people, they were a big hit, and my kid still wears his ALL THE TIME. Get a few extra because the iron-on process is not foolproof and a few got wrinkled or messed up. For an easier solution, you could also cut sticky felt for the Mario-M circle, but that wouldn't be as permanent. Girls got Princess Peach tiaras from Oriental Trading (or Mario hats if they wanted - I made extra for that reason). And then the goodie bags held mushroom rings, mushroom spinning tops, and rubber spiked "Bowser bracelets" all from Oriental Trading, plus chocolate coins and Mario gummies, and and and. This was clearly overkill. It was my first major themed party and I went a bit cuckoo-nuts. Year 2, far less ambitious favors. The next year, I just got Mario-themed art supplies (pencils, erasers, markers) from Party City (online only), and some Mario candy. 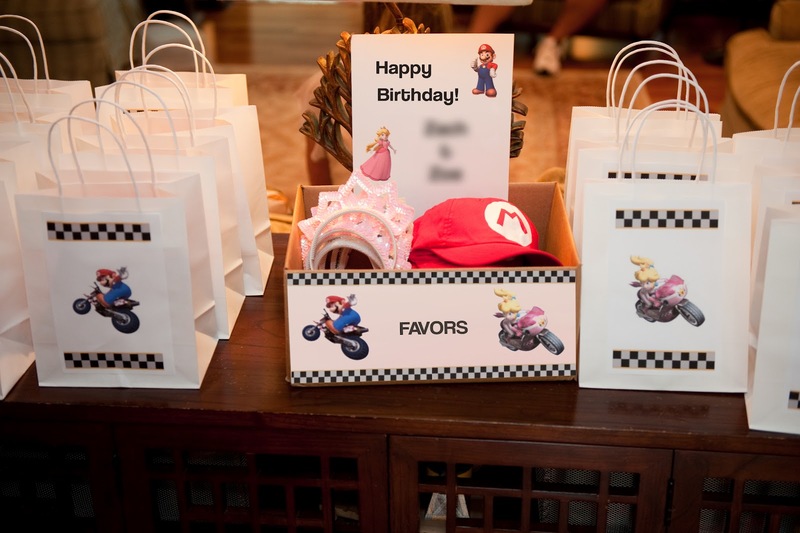 Both years, I just printed out Mario images and glued them to basic cheap-o paper goodie bags. 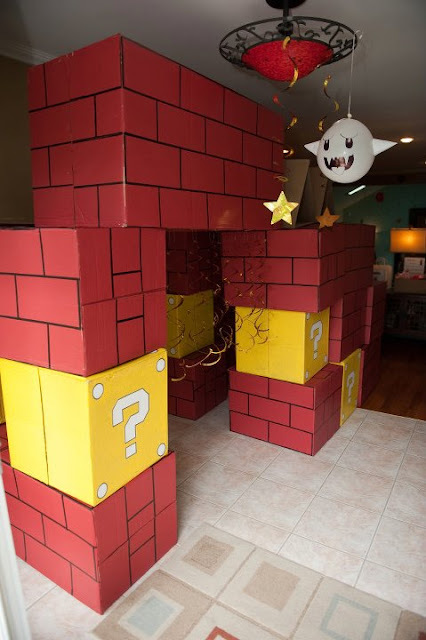 Mario brick box and question box life-size blocks! As the major decor item, I got moving boxes from a friend who had recently moved, and painted them to resemble brick and question boxes. We used the boxes to make a big Mario fort. I had envisioned the kids building with them, but it was definitely an adult job. But the kids had a great time playing in the fort. Using moving boxes was key to the success of this project, because they are made to stack neatly in the moving truck, so they all have the same width and depth (just different heights), so they bricked and stacked well. I learned a lot of lessons doing this project. The biggest one is that spray paint is almost never the right answer for anything. I used regular latex wall paint and a roller to paint these, and that worked great. The kids "helped." I painted them flat, and then used a Sharpie "Magnum" (snicker, gotta love dirty-sounding art supplies) to draw the lines on the brick boxes. After they were assembled, I printed and cut out the question marks and rivets and glued those onto the question boxes. Make sure you let the boxes dry for a long time before stacking them or laying them on top of each other. You need at least a few days for the paint to cure or they will stick to each other and mess up all your beautiful work. Hanging around from ceiling lights were these Boo ghost balloons. Oops, this one lost his ear, or wing, or whatever that thingie is supposed to be. Just white balloons, sharpie marker, and white paper cones mono-adhesived (inexpertly, apparently) on the sides. I got this idea here. I added to the easy, cheap-o balloon decorations by making these Bob-omb balloons. Black balloons (helium filled) with small orange balloons for feet and paper ovals monoadhesived on for eyes. I tied the feet to the base of the black balloon, and then used a small piece of monoadhesive to attach the feet into position. OK, let's talk food! We had pizza and usual chip-dip party stuff, but also did a few themed snacks. Chocolate moustaches make for funny photos! I was so proud that I came up with idea to make chocolate moustaches for this party, but then I later saw on Pinterest that everyone and their sister has already done that. Well, poo. But either way, chocolate moustaches = awesome. I used these molds from amazon the first year, and they were great! Then, a few days before the party the second year, I went to look for them and couldn't find them anywhere, and didn't have time to order more, so I got the Wilton moustache molds from Michael's (pictured). The Wilton molds have three different moustache shapes, and only one is Mario-y, so go with the amazon ones if you have time for them to arrive. Making chocolate is easy!! You can use the candy melts, which I understand are fairly foolproof. Or, if you're a chocolate snob like me, you can use real chocolate because it tastes better. If you want to use real chocolate and want to be sure it looks perfect, read up on "tempering" chocolate. It's a pain, but it's how you get them perfect. I totally planned on doing the tempering thing because I am a freakish perfectionist, but hadn't realized that you can't temper chocolate chips, because they have an additive to make them stay in chip shape in your cookies. Sooooo, I just didn't temper them. I just melted them, poured them in, put them in the fridge, and done. Yeah, the chocolate was a bit soft and didn't have that nice snap of well-made chocolate. And yeah, some of them got that cocoa butter "bloom." I'll tell you what, the kids sooooo did not care. People will be so impressed that you made these things, they won't care if they're not perfect. I promise. Here is the watermelon chomp. My son particularly liked how the chomp was throwing up chunks of watermelon. Yeah, that was a big hit. My sister cut him for me because I was running sooo behind in setting up the party. Thanks, sis! You did a rocking job! She also took most of these photos (some with my crappy camera, so don't judge her on that). She took the bikini photos of me too. If you're in the MD/DC area, she and her husband take beautiful photos of kids, families, weddings, etc. Here is their website if you need a photographer! Oh, and I got the watermelon chomp idea from Pinterest, but the pin just leads to a yucky scam site, so I can't credit the original source. Sorry!! Some more themey treats. Chocolate coins and sour worm "caterpillars." Not pictured, one year we also did cherry licorice "Yoshi tongues." We didn't do games the first year, but this past year, we had two games. This one, Feed Yoshi, was a big hit. I hand-painted Yoshi on a big piece of foam core and cut a hole for his mouth. The kids had to try to toss caterpillars and "spiky balls" into his mouth. I also made this "Pin the moustache on Mario" game on a piece of poster board. I cut black construction paper moustaches and put some tape on them. Here are my cute two pinning on their moustaches. Finally, what is a party without cake? There are some adorable Mario cakes on Pinterest. I went with the always-easy cupcakes. 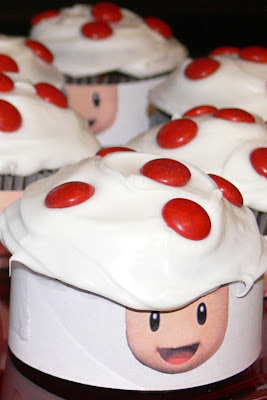 My sister had done a Mario party the year before and I got these cupcake ideas from her! Goombas and Toads! I just printed out Goomba feet and Toad faces, frosted (well, my mom frosted), and decorated. The Toad ones are obviously just M&M's. The Goomba faces are white M&Ms, black frosting eyeballs, eyebrows, and mouth, and white chocolate chip teeth. My darling girl! This is scary...the furthest I ever got on a theme party was a private thing we would do for Dan every year on his birthday... a treasure hunt! And mostly Glenn would do that! For the parties OMG!!!! they were took stressful for me to think about... So we went to the park! Hot dogs, chips.... theme : dear lord, get me through this moment. I am so impressed to know about your Mario Party! Thanks for sharing the photos. We also celebrated our son’s birthday using same theme. I am not good at party planning so got the help from my mom in all of the arrangements. She also helped to find the most spacious event venue Atlanta.